Two bass players--European free improv legend Barre Phillips and Japanese master Motoharu Yoshizawa--met at Cafe Amores in Yamaguchi, Japan in 1994, with Phillips on an amplified acoustic upright and Yoshizawa using an electric vertical 5-string bass of his own design, as the two weave and merge their unique sounds and approaches in a brilliant concert. 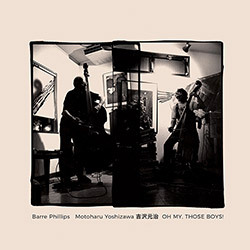 Phillips, Barre / Motoharu Yoshizawa: Oh My, Those Boys! 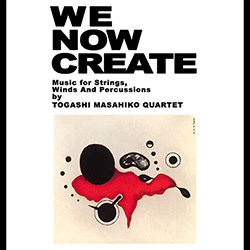 An excellent debut from drummer/percussionist Masahiko Togashi's Quartet released in 1969, a remarkable free jazz album of strong technical and creative skills, with Motoharu Yoshizawa on bass and cello, Mototeru Takagi on sax and reeds, and Masayuki Takayanagi on guitar, an important advance for the players who would go on to form influential bands like New Directions.